Whitley Bay's Thibault Charmey closes in on goal in the win over Bishop Auckland. 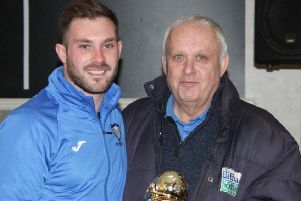 Whitley Bay produced an excellent performance to defeat in-form Bishop Auckland at Hillheads on Saturday. The visitors went into the game in fifth place and unbeaten in the league since Boxing Day, but they could have no complaints with Saturday’s 2-1 defeat, despite taking a first half lead. The first chance fell the visitors’ was on 12 minutes when prolific goalscorer Andrew Johnson headed wide from a free kick when he seemed certain the score. When Whitley settled into the game it was Andy Robertson who threatened, cutting in from the left before curling a shot wide of goal. Two minutes later Bay keeper Tom Flynn denied Johnson when the striker burst through on goal. The heavy pitch was cutting up and this led to the opening goal when McDonald’s back pass bobbled badly on the surface and Flynn completely missed his kick, leaving Andre Bennett with the simple task of putting the loose ball into an unguarded net to give the visitors a 29th minute lead, which on the balance of play they just about deserved. Bay responded in positive fashion and it took them just three minutes to regain parity. A shot from Callum Patton was blocked and rebounded around the six-yard box, where Robertson seized his chance and scored from close range. Twice in the closing stages of the half Whitley might have gone ahead, firstly when Callum Patton’s free kick drifted narrowly wide and then when Thibault Charmey broke through on the left and crossed low into the box, only for Kempster’s first time effort to be well blocked by the feet of keeper Scott Pocklington. Five minutes in the second half, a pin-point through ball from Tom Gilbey looked to have set Charmey clear on goal, but Pocklington raced off his line to save his side. Just past the hour, a free kick from Callum Patton just cleared the bar, landing on the roof of the net. Bay fans were celebrating in the 67th minute when in a flowing move Aiden Haley set up Kyle Patton down the right and when he cut the ball back across the face of goal, Kempster was on hand to tap it in from barely two yards. In front for the first time, Whitley grew in confidence and nearly doubled their lead two minutes later when Callum Patton’s free kick crashed off the bar with Pocklington well beaten. Robertson, who impressed as he continued his return to fitness following injury, was replaced by Liam Brooks for the final 20 minutes, and the youngster certainly played his part with his height causing problems for the Bishop’s defence. The visitors rarely threatened at the other end as a resilient Bay defence gave Johnson and his teammates barely a sight of goal. Five minutes from time, Brooks had a chance to put the result beyond doubt when he was played through by Callum Patton, but his shot went high over the bar. Kyle Patton then got behind the visitors defence and his cross from the right only just eluded Kempster. Whitley deservedly claimed the points and climbed two places to eighth in the table. Whitley Bay: Flynn, Gilbey, McDonald, Haley, Anderson (Allen 90), Wilkinson, K Patton, C Patton, Robertson (Brooks 72), Charmey (Glen-Ravenhill 80), Kempster. Subs not used: Potter, Long. Whitley Bay are without a game this weekend. Their next fixture is at home to Dunston UTS on Saturday, February 18.